Keeping your interior's carpet and fabric upholstery surfaces clean helps prevent undue wear and tear, so regular cleaning is a must. The non-slip grip and stiff scratch-free bristles of the Mothers Carpet & Upholstery Brush will help you keep your interior clean by loosening dirt and debris. Mothers Interior & Upholstery Brush Description Keeping your interior's carpet and fabric upholstery surfaces clean helps prevent undue wear and tear, so regular cleaning is a must. The non-slip grip and stiff scratch-free bristles of the Mothers Carpet & Upholstery Brush will help you keep your interior clean by loosening dirt and debris. Ideal for use with Mothers Carpet & Upholstery cleaner spray. The brush can also be used to work cleaners and conditioner into leather upholstery!The ergonomic handle is gently curved for maximum comfort while you scrub. Rubber finger pads on either side allow you to maintain a firm grip even if your hands are wet. The bristles are chemical resistant. Pair Mothers Interior & Upholstery Brush with Mothers Carpet & Upholstery Cleaner. Once you spray the cleaner onto the spot and let it penetrate for a few seconds, scrub the spot with the brush. Then blot the area to remove excess moisture.Mothers Interior & Upholstery Brush stores neatly on a hook by way of the hanging hole. In addition to being durable and effective, Mothers Interior & Upholstery Brush looks sharp! 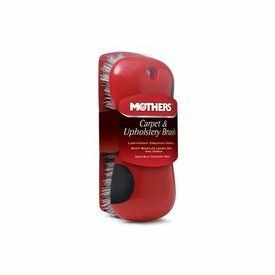 It makes an attractive and functional addition to your detailing collection.Get the best possible results from your favorite carpet cleaner with Mothers Interior & Upholstery Brush.6.5 x 3 inches.